I Cacciagalli is a burgeoning estate in the northern region of Caserta, located at the foot of the spectacular, inactive volcano of Roccamonfina, in the land the ancient Romans called Campania Felix, a particularly fertile terrain which continues to yield exceptional products to this day. Diana is a young agronomist who decided to follow non-invasive methods of cultivation to respect the land of her family’s estate and Mario is a passionate wine connoisseur, not only for taste and aroma but also for the wine’s individual story, the story of the men and women and the territorial peculiarities that a good wine can recall. Uniting Diana and Mario is not only their love for each other but also the love for their land; more than a business, theirs is a life’s journey undertaken to share a common passion for wine and for their land, to live their lives fully present, where life happen, among those very vines and fields. A generous territory with plenty of wooded areas, rich in water and chestnut groves; the uncontaminated natural backdrop forming the setting of a fertile terrain that has always been inhabited by those who knew how to love it. This is where Diana and Giovanni cultivate their 25 acres, six of which are vineyards, learning every day how to respect the necessary equilibrium that exists between people and this land. The name chosen for the label is the same name that has always designated the area where the Cacciagalli Estate is located, belonging to Diana’s family for many generations. The land, therefore, is the family’s, where grape vines, hazelnut, chestnut and olive trees have always been cultivated. Experience comes from ancient traditions of preserving and revitalizing, but above all, this knowledge is coupled with “new” understanding of respect for the territory, for the environment and for those that live there. In fact, wine production follows the prescriptions of organic farming and has recently begun to apply the principles of biodynamics to further enhance the connection with the land, leading to the reconstitution of optimal fertility, thus enhancing the typical nature peculiar to this territory. 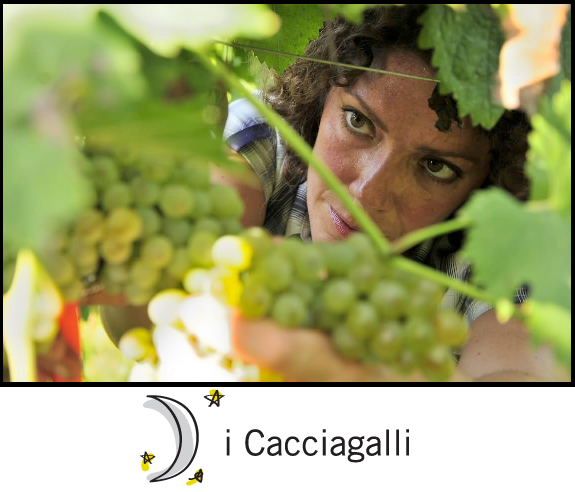 I Cacciagalli wines fully reflect this philosophy, being the fruit of passion and of respect for the various vines and their unique characteristics. To convert passion for the land and for those that live there, to respect the rhythms of nature and the love of an ancient tradition from which to draw on, but more importantly, the capacity to play. The goal is to be captured by wonder each day and learn to keep the spirit of imagination and curiosity in order to establish the natural balance between the land and man.